LOS ANGELES — In the eight years that Lisa Takeuchi Cullen has been developing and writing for television, she never had a producer insist on casting an Asian American as the lead in a show. For years, Hollywood operated under the belief that Asians couldn’t sell a movie or a TV series. That all changed earlier this month when Jon M. Chu’s "Crazy Rich Asians" debuted on the big screen, raking in $35 million in its first five days in theaters. That same week, a producer had called Cullen to pitch her a potential series. Their exchange indicated to Cullen that the box office success of "Crazy Rich Asians," the first major studio film to feature an all-Asian cast in 25 years, may have caused a tide to turn in Hollywood. Although it is still too early to tell whether the historic romantic comedy has created lasting change for Asians in the industry, producers, writers, and talent agents say that studios are now scrambling to find Asian-centric stories like "Crazy Rich Asians," which has topped the domestic box office for three consecutive weekends. Ticket sales dropped a mere 5.7 percent in its second week, and the film made $28 million this past weekend, the highest-grossing Labor Day box office in more than a decade. It’s also officially the most successful studio rom com in nine years. Last month, Chu and the team behind "Crazy Rich Asians" began working on a sequel to their first film. "Master of None" co-creator Alan Yang started shooting "Tigertail," a Netflix drama about a multi-generational Asian family. Ken Jeong landed a Netflix stand-up special that will also be directed by Chu. Amy Pascal's Pascal Pictures bought the rights to "Ayesha At Last," a romantic dramedy novel about a young Muslim girl. And, on the same day "Crazy Rich Asians" opened in theaters, Cullen sold a pilot pitch called "’Ohana" to ABC. The road from here to air is really freaking hard. I would love your company and support. If you'd like to come along, I'll post here about the highs and lows of developing a network pilot. Cullen’s project, based on Kiana Davenport’s historical novel "Shark Dialogues," will center on four hapa women who inherit their deceased grandmother’s fiercely coveted land in Hawaii. If it gets picked up as a full series, it’ll be the rare show to center non-white characters in a narrative about the island state. Albert Kim, former writer and showrunner of Fox’s "Sleepy Hollow," said "Crazy Rich Asians" has proven helpful when he pitched a show to networks this pilot season. “Even though I was developing this year's pitch just before the movie had come out, awareness of the movie was really high because of all the marketing and because of all the press,” he said. “So when I referenced 'Crazy Rich Asians' in my pitch, [the studio executives] all got it immediately." It was a notable contrast from last pilot season when Kim pitched a different drama series about a young Korean-American adoptee who suddenly inherits her family's enormous fortune (not unlike "Crazy Rich Asians" main character Rachel Chu (Constance Wu), who is thrust into her boyfriend’s world of over-the-top wealth). Hollywood has whitewashed Asian stories for decades. This year, they couldn't ignore the backlash. Yu had begun writing "Singles Day," a China-set romantic comedy, in February. Yu and her agent, Max Michael — who is head of Asian business development at United Talent Agency — had anticipated that there might be a demand for Asian-centric stories if "Crazy Rich Asians" were to perform well. Just days after the box office numbers for the highly anticipated film began rolling in, they sold Yu’s script. According to Mariko Carpenter, vice president of strategic community alliances at Nielsen, brands across America are taking notice of the film’s resonance among Asian Americans. “We're still very small in size, but what people are taking note of is not just the buying power but the influence. 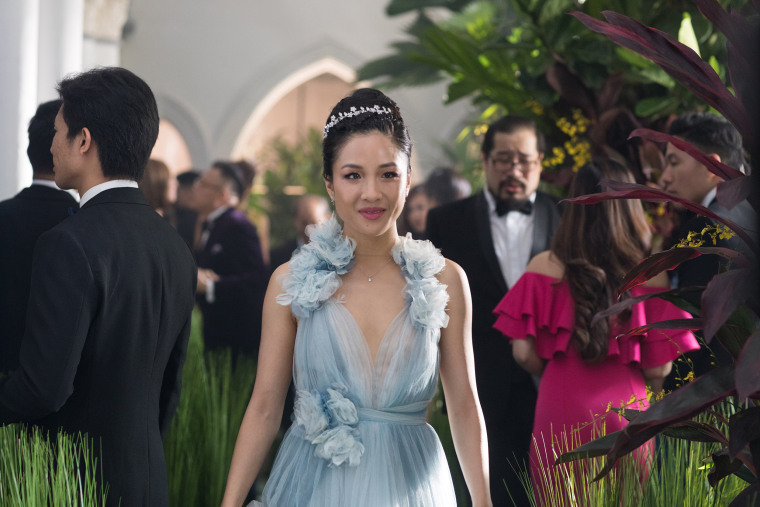 The success of 'Crazy Rich Asians' is that we've been able to create this momentum, and it really stems from us being on digital and being a digital leader,” said Carpenter, referring to the host of fans who tweeted about the film in the months leading up to the release. As for Kim, the recent uptick in Asian-centric projects makes him optimistic for the young Asian Americans looking for work in Hollywood. In the last week, two network pilots were sold that feature all-Asian casts. I also know of three cable projects, all in active development, that mostly feature Asian and Asian-American characters. It's going to happen, the momentum is there. CLARIFICATION (Sept. 7, 2018, 6:56 p.m. ET): An earlier version of this article said that Yu wrote "Singles Day" after the seeing the buzz around "Crazy Rich Asians." After the article was published, Yu emailed to say that wasn't the reason she wrote the script. She said she did so because she loves the holiday and liked the story she could write around it.